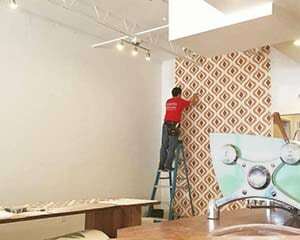 With over 30 years’ experience hanging over 100,000 rolls of wallcovering, we’re proud to be the wallpaper installer of choice for San Antonio’s top interior design firms! 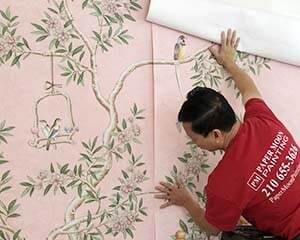 Read more about our wallpaper installation or (gasp!) wallpaper removal services here. Check out our Facebook, Houzz and Google+ pages for more! We’ve also got some informative (and quite entertaining!) blogs on wallpaper, here – enjoy! Some of our wallpaper installer “action shots”. Love the retro logo on the shirt on the right!